Here is a handy-dandy baker's dozen of 'kinks,' otherwise known as tricks, shortcuts, or clever ideas, that could prove useful while working in the lab at work or in your shop at home. One suggestion is to place a sheet of tracing paper over your schematic while wiring a circuit and draw each connection as it is completed, rather than mark up the original drawing. That was definitely good for a time when making a spare copy of a magazine page or assembly instruction from a kit was not as simple a matter as it is today. Whether it be a schematic or a set of plans for a model airplane, I always make a copy of the original to work and draw notes on. 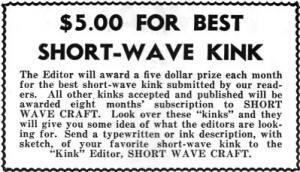 The Editor will award a five dollar prize each month for the best short-wave kink submitted by our readers. 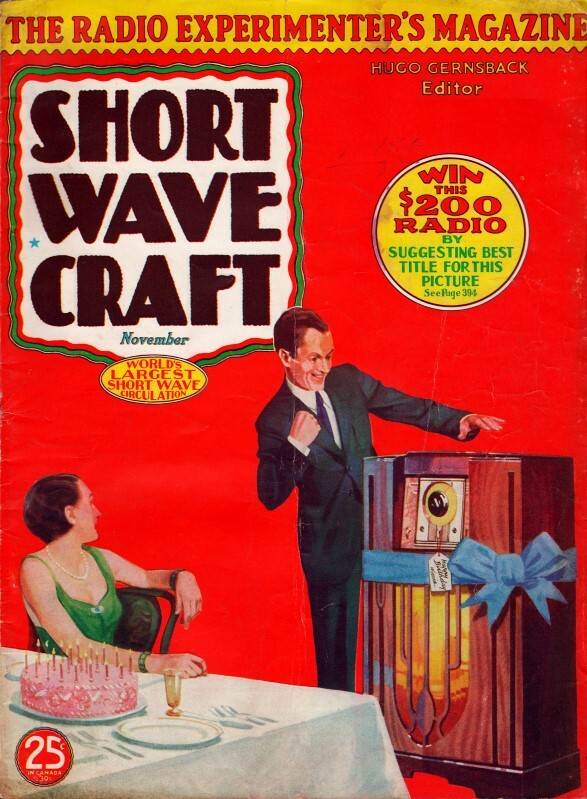 All other kinks accepted and published will be awarded eight months' subscription to Short Wave Craft. Look over these "kinks" and they will give you some idea of what the editors are looking for. Send a typewritten or ink description, with sketch, of your favorite short-wave kink to the "Kink" Editor, Short Wave Craft. I wish to offer the following short-wave kink which has proved to be or great value to me and is, as far as I know, an original idea. Take a piece of ordinary tracing paper and lay it over the diagram or blue-print from which you are hooking up a receiver. As each connection is made, mark it with a pencil on the tracing paper. When the diagram on the tracing paper corresponds with the original, you know the set is correctly wired. This eliminates a lot or hunting for "lost" or "forgotten" leads and is invaluable in wiring complicated "supers" where a short connection may be accidently overlooked. I have found this kink very useful in connecting head-phones or speakers to experimental sets. When wiring up "bread-board" sets, one does not always have the phone tip jacks or clips ready to use. The kink described will do away with this worry. Holes large enough for the tip jacks are drilled in the Fahnestock clips. The clips are then fastened to a small wooden platform by the jacks. Many set-builders retrain from using low-cost galvanized iron for chassis or panels because of its finish, but by following these instructions, they may produce a beautiful satin finish on it. Lay the piece to be worked on on a flat surface and pour a little water on it. Next, sprinkle a little Dutch Cleanser or kitchen cleanser on it. and then rub it well with steel wool, in a circular motion. In about five minutes a very silvery finish will be obtained, equal to that of aluminum. It may be given a high luster if polished with silver polish. The sketch is enclosed on another sheet. I hope this kink will be acceptable. I have found this idea of cutting holes in metal chassis and panels to be better, quicker and easier than any other tool I know of. I simply use an ordinary plumbers' pipe reamer that has a taper of 1/2 inch to 2 1/2 or 3 inches. This tool is one that will drill any size hole, while an ordinary one has only one size, it is also a toot that won't wear out quickly and it will fit an ordinary brace. It is easy to use and drill neat holes for tube sockets or anything else. I don't believe a sketch would be necessary as every one knows what a pipe reamer or countersink is; you have my permission to express my idea in any sketch for the magazine. I am a reader of Short Ware Craft and find it my favorite radio magazine. I submit the following kink for entrance in your monthly contest. I have found it quite useful in S. W. work. This is a wave-trap to overcome interference from a near-by station. The trap consists of a parallel-connected coil and condenser inserted in the antenna lead of the set. The coils consist of 72 turns of No. 22 D.S.C. wire on a 3-inch diameter form. The condenser should be of 0.00025 mf. capacity. Simply tune the set to the best setting for the desired station. It may prove necessary to shield the wave-trap if the undesirable station is very close. - F. J. Spatz, Jr. Inexpensive stand-off insulators can be made from ordinary porcelain lead-in tubes. A length of dowel is glued in one end of the tube and any form of clamp or soldering lug is fastened to this with a screw. The large end of the insulator is clamped to its support by a small counter-sunk block of wood and two long bolts or screws. To avoid splitting the tubes, a hole should be drilled in the end before driving the screw. Here is a simple little kink used when winding plug-in coils with fine wire. After the coil was wound I found it difficult to lead the thin wire through the coil prongs. To overcome this difficulty, I took a thin sewing needle and threaded the end of the coil wire on it, then by pushing the needle through the prong I could draw the wire after it. The wire was then pulled tight and soldered. If tube bases are used for coil forms, the solder must first be cleaned from the prongs so that the needle will slip through easily. Today no receiver is really complete without some arrangement for "band-spreading." This system is not merely a substitute, but one that I use in preference to the conventional "large condenser" method of band-spreading. Not only is it possible to construct the receiver on a much smaller base, but by using this method, one can have a truly "calibrated" receiver. It is no longer necessary to tune critically for a reference station, for by simply flipping the switch to one of the three positions, one can find the desired station at exactly the same position on the dial every time. After looking all over the place for containers for nuts, bolts, resistors, etc., I hit upon this idea. Take an old milk can, large size; cut through as shown on the dotted line, then bend over. This makes a two-compartment container. Several of these cans may be laid side by side, making very handy trays. - F. W. Osborn. Sometime ago when in the need of a vernier dial, I hit upon the following idea, which is clearly shown in the drawing. The only necessary parts are an old dial, some string or fish cord, a spool, and a short length of metal strip. The knob of the regular dial should be grooved for the fish cord. The metal is formed as shown in the drawing and fastened below the mounting board on which the condenser is fastened. Another advantage of this system is the total absence of "body-capacity" effects, because the hand is so far removed from the condenser. Here's a kink I find very satisfactory for eliminating "body-capacity" where an insulated shaft coupling is not available. Remove the knob from the front of a vernier dial and file a slot in the shaft to fit the end of a trimmer condenser tool. This being insulated, gives very good results in eliminating "hand" capacities. It is especially adjustable to ultra-short wave receivers. where hand capacities are annoying. Here is a simple method of obtaining a high voltage "B" supply without the use of a power transformer. A couple of 27s are made to double the voltage and rectify it at the same time. The output voltage depends on the value of the condensers X and Y, which should be from 4 to 8 mf. Although this kink is not original, I do not recall having seen it in Short Wave Craft. My plug-in coils are fixed as shown in above drawing. Then use sandpaper to roughen the top edge of the coil; next cement a poker chip with glass knob fastened through hole in top to the coil. This is very handy when changing coils, and does not injure the coil windings.